It’s impossible to miss the smile in Fr. James Walker’s voice as he outlines plans for his final retirement from ministry in the Diocese of Gallup. Not that he’s happy to leave being a pastor – on the contrary, his life as a parish priest has been a deep source of happiness for himself and those he serves. But Fr. Walker is a man who never stops moving and learning, and since his retirement date on July 1st, he’s already enrolled in classes at the Catholic University in Avila, Spain, the first item on his extensive bucket list. Fr. Walker’s final assignment was pastor of St. Rose of Lima Parish in Blanco, NM and St. Mary Parish in Bloomfield, NM. Before that were several assignments in Gallup, at St. John Vianney Parish and Sacred Heart Cathedral. But it was in Blanco that he would face one final, decisive challenge. Fr. 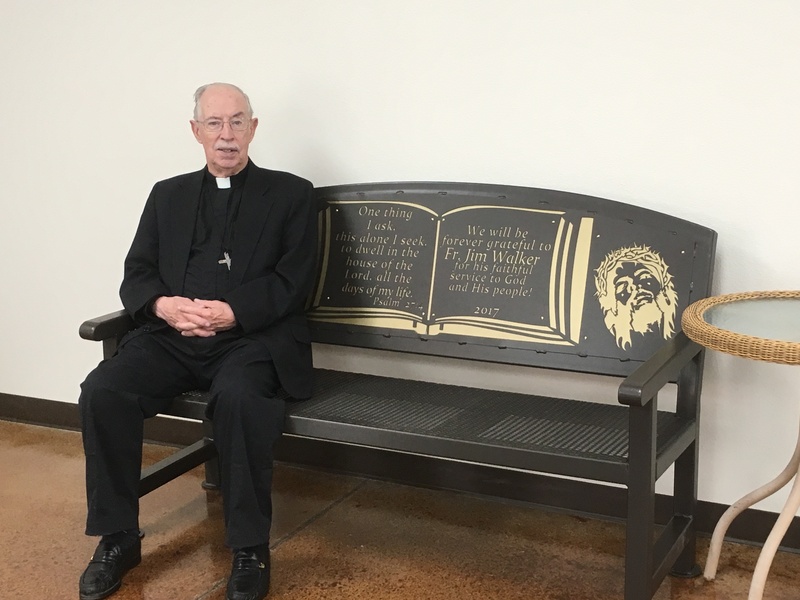 Walker sitting on a bench made by parishioners and dedicated to him for his service at Blanco. Blanco, NM is a small township near Farmington with deep roots. Many of the families here can trace their local family tree back over a hundred years. But these Catholics, who faithfully attend Mass and parish functions and give their full support to the Church, had no proper place to gather. A new parish hall was badly needed, and although a fund was set up, very little progress was made for over a decade. Fr. Walker had served a previous assignment at Blanco, and it always bothered him that his parishioners hadn’t received their building. Then the parish got lucky – a rancher who attends the parish had an unused building shell, complete with walls and roof, sitting on his property. After he agreed to let the parish use it for the new hall­, the parish set about raising $86,000 in four months. Most of this came through raffles for NFL games, vacation packages, and various community fundraisers. Bishop Wall blesses the new Family Center. One fundraiser in particular struck Fr. Walker for its kindness – the nearby Benedictine Sisters in Gobernador, NM, who themselves are trying to raise money to build a new chapel of their own, donated proceeds from their annual Ice Cream Social in 2016. When the nuns could not have their Social this year, St. Rose parishioners returned the favor by holding a new raffle just for the Benedictines. In a mere few months, the dream of nearly fifteen years came together. The final change was the name. 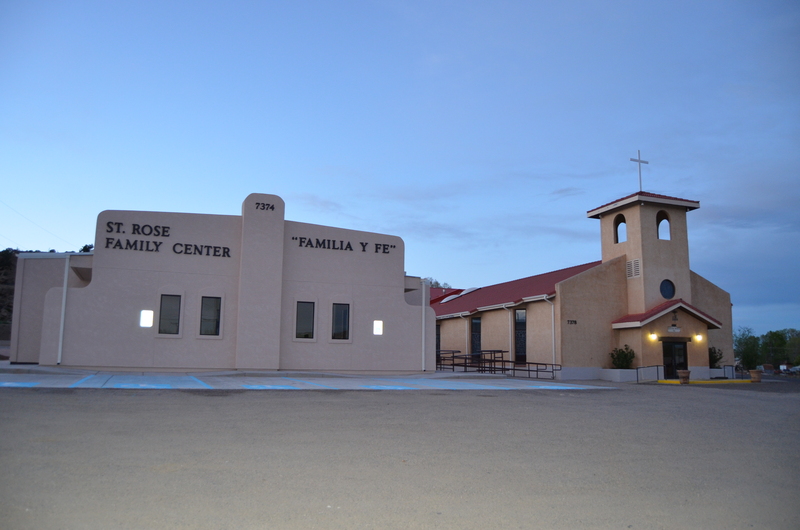 Instead of a parish hall, the new building became the St. Rose Family Family Center. The words “Familia y Fe” – “Family and Faith” are displayed prominently at the front of the building. Fr. Dan Daley, a previous pastor, first coined the phrase when Blanco celebrated its 100th anniversary. The new Family Center at Blanco. 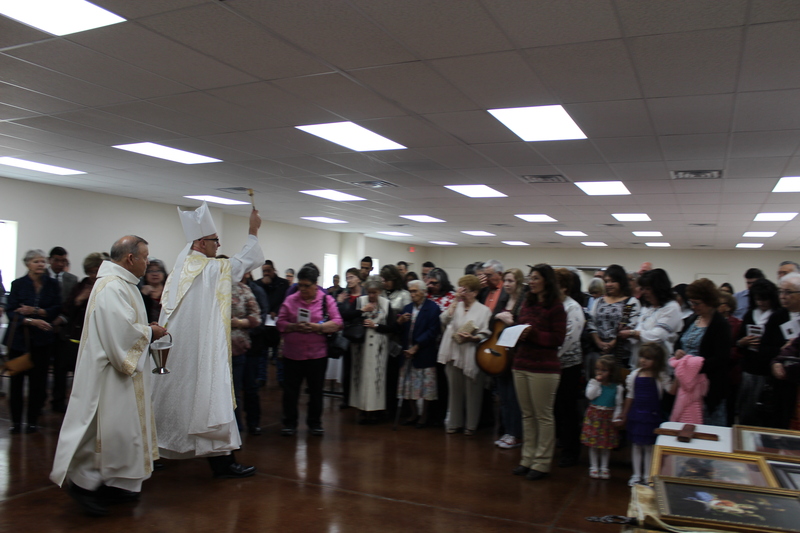 The parishioners at St. Rose of Lima finally have their gathering place, and the town of Blanco has a new community center. The parish plans to make it available for weddings, receptions, and other meetings. And now, as he retires, Fr. Walker leaves a thriving parish behind. Every RCIA and Sacramental class is larger. The parish had to hold three 1st Communion Masses to accommodate all the children taking their first Eucharist. And so many adults needed to receive confirmation that Fr. Walker received delegation from the bishop to confirm some of them himself at the Easter Vigil Mass. He is now readying for a pilgrimage to churches and basilicas on the East Coast, and then it’s off to a sabbatical program the the North American College in Rome, where he will study the life and legacy of St. Peter – “The whole story of St. Peter fascinates me,” he says. Never one to stop learning and traveling, Fr. Walker recalls his pastoral ministry fondly, thanking his staff, volunteers and parishioners for all their efforts. Note: An earlier version of this article contained an incorrect spelling of “Gobernador” and “Familia y Fe”. The article has been updated with the correct spelling.